What a mouth on Minnie! And I don’t mean it pejoratively. (I just wanted to get your attention.) Grandma Minnie Bloch is articulate and sensitive as she meticulously narrates the three-generational story that includes her own early life with her husband, their move to the USA from Eastern Europe, and the family she creates. 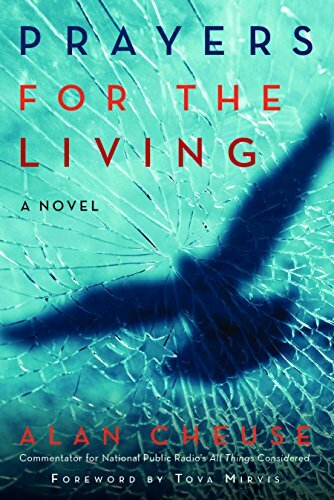 Minnie is the narrator/observer—acting almost like a Greek Chorus—in the stirring novel Prayers for the Living created by veteran novelist and National Public Radio literary critic, Alan Cheuse. Although she is not educated (in the formal sense), her intelligence and life experience enable her to depict for us so many living characters: her son Manny, who is a Reform rabbi and a businessman; his psychologically impaired wife, Maby; their problem-laden daughter, Sarah; and Manny’s mistress, Florette, a Holocaust survivor and a member of Manny’s congregation. And into this mix we must also include Maby’s brother, Mord, who takes brother-in-law Manny into the family business. How does Minnie narrate the rise and fall of this middle class Jewish family? By telling her story to friends during occasional coffee-klatsch meetings, portraying with motherly calm and painterly skill all the people she has encountered. Behind the voluble narrator, who speaks always from the heart and often with poetic grace, stands the artistry of Alan Cheuse, a sharp-eyed writer who is the brilliant voice behind the voice. Although the central narrator in Prayers for the Living (an ironic title, an inversion of the Kaddish, known as the Mourner’s Prayer, or A Prayer for the Dead) is Minnie, the protagonist of the book is Manny, well regarded by his congregation, who splits his duties between rabbinic work and business, ultimately not a happy partnership. As the novel progresses we learn of daughter Sarah’s missteps in college, Maby’s mental imbalance and alcoholism, and Manny’s visits to Florette, who is ostensibly painting her rabbi’s portrait but has other non-esthetic designs on him. In her telling Minnie does not hide her family members’ flaws. The character of the book’s heroes, often shaped by earlier events, in combination with the exigencies of the present, leads them to their destined paths. Alan Cheuse plans the suspense, gives the hints of things of come, and arranges for Minnie to occasionally offer remarks akin to: “But I’ll tell you about that a bit later. . . .” By so doing the author achieves a unique fluidity of time zones. Minnie is the bedrock of the family, the only solid and trustworthy character in the book; she has perfect pitch for rhythms of speech of Jewish women of a certain age, and faithfully reproduces the conversations of other characters in Prayers for the Living. This enables Alan Cheuse to penetrate the psyches of his characters, their hopes and tremors. Some central events are tiny sparks that build up to the conflagration that follows. Among them: Minnie, in Europe, fleeing from a groom that has been forced upon her; an accident in New York involving Minnie’s husband which her son, Mannie, witnesses; and Sarah caught strumming a guitar on Yom Kippur by her rabbi dad. By the riveting end of the book, whose intricacies and trajectory you have to discover for yourself, you can’t wait for one page to lead to another. You have a sense of what is going to happen—Minnie gives you little choice—but you still hope it won’t happen. Maybe a surprise will come your way. Perhaps Minnie’s assessment is wrong. But even if you suspect what will happen and you know why, you still don’t know how it will happen. Thank you, Minnie, for sharing with us your words and thoughts, your motherly wisdom and compassion. Yes, it all comes from Minnie’s mouth—to our ears and to our hearts. Curt Leviant's most recent work of fiction is Zix Zexy Ztories.